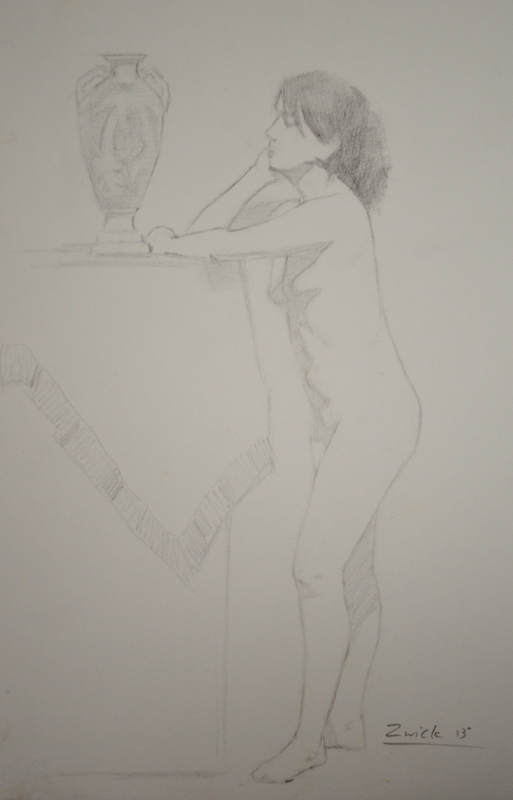 Figurative drawing and painting is the scale on which realist artists are judged. This is both because it is very difficult, and because everyone, even someone who is not an artist, knows what the human body is supposed to look like and can spot errors easily. This course is an introduction to drawing the figure from life. Each class we will be working with models in different poses as we discuss approaches to accurately capturing the models gesture, body type, sense of weight and likeness. Through live demonstrations, lectures, and one-on-one personalized critiques, students will learn to accurately draw the human body from life. This course is a lead into figure painting. This workshop focuses on linear drawing rather than value drawing. Students will focus on pushing the accuracy of their eyes as they develop light shapes, shadow shapes and contours of the model. Using these tools they will work to understand how these different aspects of a drawing work in harmony to describe the underlying anatomy and structure of the model and pose. The skills and techniques learned in this class lay the foundation for all other figurative work. Drawing accuracy is the most important element of any figure painting or portrait painting. The basics cannot be stressed enough for artists at any skill level. We believe that art is more fun when shared with a friend, bring a friend who has not taken one of our courses before and you will both receive a %20 discount off of the listed workshop price. To Sign up for this workshop or to receive more information, please contact us via e-mail or phone, or send a message in the form below.